Jack Mallory and Laura Morse are agents with the Consultancy. The Consultancy is an independent, for-profit agency which exists to take on those assignments which are either too dangerous or far too messy for conventional government agencies to tackle. There were always missions which someone in a Western government deemed necessary but which too politically insensitive to be seen doing or which would cause an administration to be voted out of office should the mission go bad. Gray was the name of the man who founded the Consultancy. A short, rather fat man with “a large head thinly covered with dull silver curls”, Gray wore glasses and walked with the aid of a cane. His appearance would not lend credibility to his true history, one that involved capture during the Korean War and a two year period of torture at the hands of Chinese who were happy for the opportunity to practice their craft. Despite the injuries, he managed to escape and make his way to Seoul and freedom. Shortly thereafter, Gray disappeared and a man named Markham appeared in the streets of Madrid pushing his way into a Spanish gang. He was as ruthless as they came and he rose to near the top in a short period. Then one night a bloodbath occurred, the top people were killed, warehouses and stockrooms set ablaze, pages of incriminating evidence sent to Interpol, and many, many millions of Swiss francs disappeared. So did Markham. And Gray reappeared with enough funds to launch the Consultancy with all the resources he knew it needed to do the job. This included the ability to pay very well the large number of agents it employed. Key among those agents is Jack Mallory, a quiet, introverted ex-soldier, 34 years old. He stands 5'11” on a very slender frame capable of swift, agile action when needed. His wide shoulders look somewhat out of place above a waist that tended to be too thin for when Mallory was not on assignment he tended to not eat and when he was, eating was often a luxury. His eyes are a cold gray which matches his hair, turned gray since his late twenties. He has been an agent for several years and his reputation is the best, matched by his reputation with the ladies. Laura Morse is an agent with the CIA but seconded to the Consultancy as liaison and considered one of the best analysts the Agency had. A luscious beauty born of a wealthy, high society family in Boston, she is in her late twenties and has been with the Agency since she graduated university. Though she is trained as an analyst, her physical abilities in hand-to-hand combat and the quickness with which she can move when needed makes her a dangerous adversary. She is also considered an ice queen as she rejects one offer after another with a cold glare that keeps the suitor from coming back. She does not let on but if the suitor were Mallory, the result might be different. Written by Forrest DeVoe, Jr. When a fellow agent is killed in a fiery, gruesome manner, Mallory and Morse are sent by their boss to get revenge on the murderor, a mission made difficult because he has his headquarters inside an extinct volcano on a South Seas island. A wealthy former black-marketeer called the Dane is offering a spy satellite which had been stolen and his asking price was a half billion dollars, an outrageous sum for the early 60s. It might be worth it, though, because it is Hitler's long-lost Project Archangel. 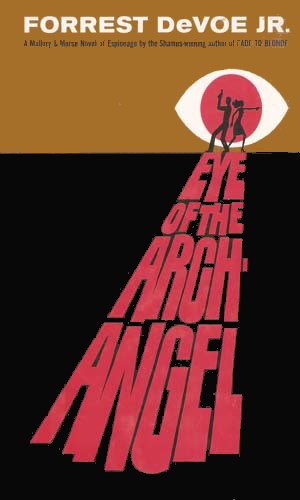 The most interesting aspect of this series about spies in the 60s written in the late 2000s is the retro attitude the books deliver. Take Bond from Thunderball, throw in some Napoleon Solo working for an international organization, and add a good amount of the Avengers' male-female team-up. 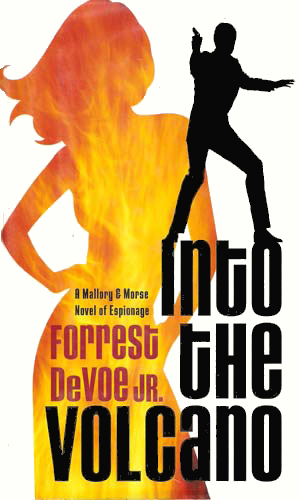 That gets your Mr. DeVoe's tour-de-force entry into the spy genre. He had already made a mark for himself in the hard-boiled detective field. Now this series puts another feather in a strange but entertaining hat. I admit when I picked up the first book I groaned. I don't much care for post-writing unless the writer takes us to the far past. In other words, I don't like a book written in 2005 taking place in 1955. The danger is always too great to make characters far too wise to be true, or too stupid to be true. There are some good ones out there but my bias is just too strong. So imagine when I discovered that the purpose of the book was to return us with affection to those days, giving us what we really loved about the spies we read and watched. Reading the book, I grinned more than I had in a while. Mr. DeVoe really pulled it off in style. And I am in love with Laura Morse. She may be an Ice Princess, but I love her. Delicious retro series. I wish there were more. Fantastic series. Very well done. Fans of the 60s style of spy fiction will love these. Only problem is that there are only two.